At V Care Dental, we understand that people want to show off straight and properly aligned teeth when they smile. Fortunately, we boast a team of professionals who are trained and experienced in orthodontics. Our highly trained dentists can provide affordable dental braces that correct the alignment of your teeth and improve the appearance of your smile. This has the added benefit of preventing tooth decay and gum disease due to straighter teeth being easier to keep clean. Our dentists pride themselves on providing cheap braces in Melbourne for people of all ages. Depending on your specific needs, you may benefit from either fixed braces or removable braces that are highly effective at straightening your teeth. Once we assess the condition of your teeth with x-rays and moulds, we can determine which option will work best for your specific needs. At the second appointment, the dentist will outline your treatment plan and discuss all the options available to you. In many cases, permanent teeth need to be taken out to create space in your mouth so that the remaining teeth can be moved with the help of orthodontic braces. If this is the case, the extractions are carried out by your regular dentist. Following this, we will outline your treatment plan and give you an indication of how long the process will take. 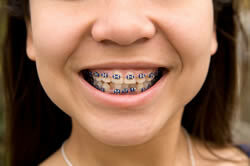 A number of appointments will be scheduled to fit the braces properly. Further appointments will be necessary at regular intervals to maintain the quality of your orthodontic braces and keep track of your progress to achieve the best possible outcome. Is the treatment painful? No, although braces can cause mild discomfort that over-the-counter pain medication can relieve. Are braces expensive? The cost will depend on your specific needs, including the condition of your teeth and how much work is required to realign them. Are there inconspicuous options available? Yes, recent innovations like Invisalign are available that look more aesthetically pleasing. Is it too late to start wearing braces? It’s never too late to start wearing braces and correct your teeth. V Care Dental is proud to offer affordable dental braces and other orthodontic treatments at our Frankston and Patterson Lakes dental clinics. Contact us today for more information.